And thank you. The alumni association presents its annual awards for career achievements and service to IC. Herman E. Muller Jr. 51, a longtime member of the Ithaca College Board of Trustees who has been its chairman since 1993, received this years Distinguished Alumni Award. Muller, who serves as a private financial consultant after years in accounting and management consulting, holds a bachelor of science degree in management from Ithaca College and a masters degree from Columbia Universitys Graduate School of Business. Muller has long been active in community service. With a keen interest in the arts, he has also served as a director/ trustee of the National Institute for Music Theatre, the Lake George Opera Festival, the International Leopold Stokowski Society, the American Symphony Orchestra, and the Manhattan School of Music. At Ithaca Muller has served with distinction both as board chair and as a member of various com-mittees. He and his wife, Evelyn, live in Diamond Point, New York. Tom Nugent 36 was the recipient of the Lifetime Achievement Award. A 1970 inductee into the Ithaca College Sports Hall of Fame, he is regarded as one of college footballs greatest innovators for the work he did over a 17-year coaching career at the Virginia Military Institute, Florida State University, and the University of Maryland. At VMI Nugent developed the famed I formation, which will forever link his name with the likes of football legends Knute Rockne and Amos Alonzo Stagg. At Ithaca Nugent won 10 letters in football, basket-ball, baseball, and track. A captain in the army air corps during World War II, he was a fitness trainer for officers heading overseas and then director of entertainment for a base in Missouri. 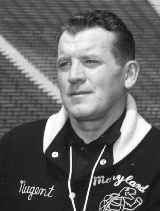 Later he coached high school football teams in Virginia before accepting the position at VMI in 1949. He coached until 1966, when he began a four-year stint as an ABC television color analyst. Nugent is also a member of the Florida State University Sports Hall of Fame and the state of Floridas hall of fame. The Outstanding Young Alumni Award went to Joseph R. Olefirowicz 94, who is both the associate music director for the German company of Miss Saigon and the conductor for the German company of Beauty and the Beast. He previously served as director of the German version of Andrew Lloyd Webbers musical extravaganza Starlight Express. Olefirowicz gained national attention at age 11 after singing in a contemporary opera with the Boston Musica Viva chamber ensemble. By age 14 he was conducting his own 30-voice choir. At Ithaca Olefirowicz performed as a vocalist and instrumentalist and worked on producing, directing, and even designing lights for a number of College musical theater productions. His College credits include music direction The All Night Strut (the first main-stage musical to be conducted by an undergraduate), The Best Little Whorehouse in Texas, and student productions like Three Guys Naked from the Waist Down. Charles Werly received the James J. Whalen Meritorious Service Award. An Ithaca native, Werly established the Jane Woods Werly Endowed Scholarship Fund for students majoring in theater arts or music and concentrating in musical theater. Werly set up the scholarship in 1982 as a 50th wedding anniversary gift to his wife, who attended the Ithaca Conservatory of Music and had a lifelong appreciation of music and the theater. Werly received a B.S. degree from Cornell University in 1927 and an M.B.A. from Harvard Business School before embarking on a career in finance. He retired in 1975 as chairman of the board of the Putnam Group of Mutual Funds. He is a trustee of the Saquish Foundation, which he and his wife established as a vehicle for their philanthropy, and a former trustee and alumni association president at Cornell. Werly maintains a close relationship with Ithaca College and continues his enthusiastic support for the fund, which has awarded more than 240 scholarships. He often visits with scholarship recipients and has kept in touch with many of them throughout their careers.